D-Celtech UK (previously Weforma UK) is the UK Sales and Support Distributor of the Weforma GmbH range of industrial shock absorber deceleration & damping components for industrial and heavy duty engineering applications. The company provides high quality adjustable, self compensating linear and progressive industrial shock absorber buffers that are precision engineered at its modern factory site in Germany offering increased efficiency and cost savings. D-Celtech UK can supply bespoke customer specified heavy duty hydraulic industrial shock absorbers in a quick delivery time for use in applications such as overhead crane shock absorbers, automated stacker warehouse industrial shock absorbers for high-rack facilities, port harbour cranes shock absorbers, industrial shock absorbers for military use, test rigs shock absorbers, as well as elasto fluid buffer stops for railway trains, shock absorbers for cable cars, swing bridges or emergency use industrial shock absorbers throughout heavy engineering steelworks and mining industries. The range of heavy duty industrial shock absorbers are used in many different industrial, marine and military areas to protect machines, equipment and goods from heavy impacts. Supported by D-Celtech UK the product range covers the acclaimed Weforma Mega-Line® range of industrial shock absorbers as well as heavy-duty shock absorber buffers. 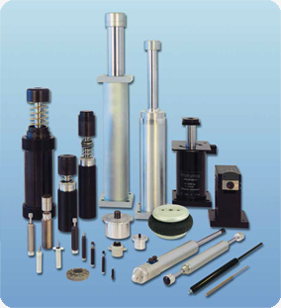 Deceleration speed damping cylinders, door dampers, rotary dampers, speed rate controls and gas spring struts both standard and lockable as well as a wide range of air springs, rolling lobes, metal cushions, steel spring isolators and elastomer springs for vibration control isolation. Feed escapements and grippers for parts handling, pallet stoppers and positioning stopper cylinders for conveyor transfer systems complete the product portfolio. With over 30 years experience in the development and manufacture of industrial shock absorber deceleration components and having established an excellent reputation for offering a quick delivery time to providing both standard and special versions of industrial shock absorbers Weforma & D-Celtech UK can offer you the right deceleration control buffer solution. The high quality specification of the industrial shock absorber product range is confirmed by the award of DIN ISO9001:2008. With the help of a calculation software sizing tool for industrial shock absorbers, heavy duty shock absorber buffers, rotary dampers, metal cushions, crane bumpers, elastomer springs, air springs and gas springs the best deceleration solution can easily be found. CAD drawing packages are available to download in 2D & 3D formats.